Accompanying the cutback in the General Staff was the assignment of all but two special staff agencies, the Legislative and Liaison Division and the Office of the Inspector General, to the Army Service Forces. There were several reasons for the increase in size of the General Staff toward the end of the war. The events themselves indicate that Lt. Gen. Thomas T. Handy, who succeeded McNarney as Deputy Chief of Staff, did, not exercise as tight a control over the department as General McNarney. Perhaps a more important reason was the traditional confusion in the Army between the role of the General Staff as a planning organization and its role as an administrative agency assisting the Chief of Staff in directing and controlling the War Department bureaus. While General Marshall and General McNarney tried to confine the General Staff to planning, the General Staff still had to co-ordinate and supervise the three commands and it could not avoid involvement in their activities. G-1 and G-4 complained that co-ordinating the commands was laborious because they had to go to them for the information required to make decisions. General Somervell's Director for Plans and Operations, Lt. Gen. LeRoy Lutes, admitted that the reason ASF represented the Army on various joint and combined supply committees was that ASF had the information required for prompt action, and that going through G-4 would simply delay matters. Similarly General Marshall consulted General Somervell on supply matters rather than G-4 because his staff had the information required. With its reduced staff G-1 consisted of the Officers, Enlisted, and Miscellaneous Branches. A Statistics Branch was added in July 1943 to help develop uniform personnel reporting in the Army. A new Legislative Section merged with the Miscellaneous Branch to form a Legislative and Special Projects Branch. In March 1944 the Office of the Director of the Women's Army Corps was assigned to G-1. Too large rather than too small a staff created serious management and organization problems for G-2. Its staff more than doubled in size from 1,000 in 1941 to 2,500 at the end of the war.9 In order to separate G-2's staff from its operating functions, the Marshall reorganization had created a new field agency, the Military Intelligence Service (MIS), theoretically outside the department, as an operating command. Almost immediately the distinction between G-2 and the MIS was largely wiped out by appointment of the Deputy Assistant Chief of Staff, G-2, as the Chief of the Military Intelligence Service and the G-2 Executive Officer as Assistant Chief of the Military Intelligence Service for Administration. The fragmentation of responsibility for personnel, aggravated by the manpower shortage, was the principal frustration for G-3 during the war. It was responsible for mobilizing, demobilizing, and training the Army, for determining the overall size or troop basis of the Army, for establishing unit tables of organization and equipment, and for dealing with OPD on allocating troops for overseas shipment. All of these functions depended upon the availability of military manpower. manpower shortage and the apparent irreconcilability of statistics from various sources on the number of men actually in the Army at any given time. While division of responsibility created serious problems for G-1, the reverse was true in the case of G-4. Its major problem was the deliberate centralization of responsibility for supply and supply planning in General Somervell and ASF by General Marshall. For most of the war his staff rather than the G-4 staff dealt with OPD and the various joint and combined committees on logistical planning. When General Somervell attempted to obtain formal recognition of his status as General Marshall's supply adviser instead of G-4 in mid-1943, his proposal backfired. As a result G-4's formal functions and its staff were increased.17 The assignment to G-4 of officers unfamiliar with the Army's supply system created additional problems. supply programs covering the next year or two, while the Policy Branch made "policy" decisions on current matters. As a practical matter it was still the ASF Planning Division under General Lutes that performed the detailed logistical planning for current and projected overseas operations in conjunction with strategic plans developed by OPD. The Planning Branch had a Theater Section which supposedly developed broad policies and directives for the use of the Army's logistical forces both overseas and in the zone of interior. It had special responsibilities for hospitalization and evacuation. Another mission was to develop a uniform, coordinated set of supply regulations out of the welter of conflicting directives on the subject issued by various agencies at all levels of command. An Organization Section studied, reviewed, and revised the Army's logistical organizations. A Special Projects Section studied logistical doctrine, supervised management of Army logistics, and was responsible for logistical aspects of mobilization, demobilization, and postwar planning. The Programs Branch was responsible for balancing military requirements with the resources available and for approving new equipment and materiel. Its Equipment Section dealt with new weapons and equipment. A Requirements Section developed the Army's supply requirements. After July 1944, it also prepared the supply section of the Army's Victory Program Troop Basis and the Overseas Troop Basis and coordinated the Army Supply Program generally. All three functions had been previously performed by OPD. An Allowances Section analyzed and approved standard as well as special allowances of equipment for Army combat units and other organizations. An Installations Section determined supply plans and policies as they applied specifically to posts, camps, stations, and other facilities under the Army Installations Program. Of the five new War Department Special Staff divisions added after the Marshall reorganization, two of them, the War Department Manpower Board and the Strength Accounting and Reporting Office, concerned personnel; another, the New Developments Division concerned research and development of new weapons and material; a fourth, the Civil Affairs Division, dealt with military government of liberated and occupied territories; a fifth, the Special Planning Division, was responsible for demobilization planning, universal military training, and the postwar organization of the Army. Three former special staff agencies assigned by the Marshall reorganization to Army Service Forces, the Budget Division, the National Guard Bureau, and the Office of the Executive for Reserve and ROTC Affairs, were restored by the end of the war as special staff divisions as-the result of political pressure from Congress. The Information and Education Division, an outgrowth originally of The Adjutant General's Office's responsibilities for personnel and morale services, became a special staff agency in September 1945, when the War Department decided to merge all information services under a Director of Information who reported to the Chief of Staff. The other agencies involved, the Bureau of Public Relations and the Legislative and Liaison Division, were already special staff agencies. The political consequences of American military operations in liberated and later occupied enemy territory were such that neither Secretary Stimson nor General Marshall could avoid assuming personal responsibility for them. Secretary Stimson centralized War Department responsibility for this function in the Civil Affairs Division created on 1 March 1943 as a special staff division of the War Department General Staff. 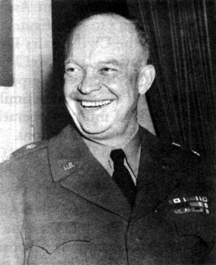 Military government policy had become a critical problem shortly after the landings in North Africa at the end of 1942 when Lt. Gen. Dwight D. Eisenhower found himself in political difficulties because of his dealings with Admiral Jean F. L. Darlan as de facto head of the local French administration. Eisenhower requested instructions from the War Departmenton how to deal with the situation. At that time, following the precedent of World War I, military government was the responsibility of the local overseas theater commander. There was no single agency within the War Department to provide direction on this subject. By default OPD, as the liaison between General Eisenhower and the Joint Chiefs of Staff, was handed the problem. In March 1942 a military government training school at the University of Virginia in Charlottesville was established under the Provost Marshal General. Efforts to develop military government policy bogged down in disagreement within the administration over whether control over civilian populations in militarily occupied areas should be a military or civilian function. Similarly, efforts to agree on a War Department position on military government were stymied by disagreement within the General Staff until General Eisenhower's request made the problem immediate and urgent. CAD dealt with theater commanders overseas through OPD which had one representative on the staff of CAD. The International Division of ASF, concerned with civilian supply problems overseas, also had a representative in CAD. Because no critical manpower shortages developed during World War I, the War Department did not anticipate the problem in World War II. A second complicating factor was the division of responsibility for personnel policy and operations among many agencies within the department. 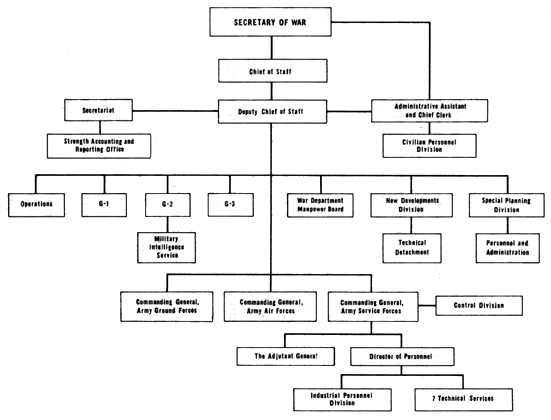 (Chart 9) Centralizing responsibility for this .function in one agency would have required a major reorganization causing dislocation and administrative turmoil throughout the Army. Responsibility for military personnel operations was divided among G-1, G-3, OPD, the three major commands, the seven technical services, and the administrative services. Responsibility for civilian personnel was divided among the Secretary of War's Civilian Personnel Office, Army Service Forces, and the technical services. After the Marshall reorganization, G-1 was supposedly limited to policy planning and co-ordination among the three major commands. But, in practice, as indicated earlier, with its drastically reduced staff it became a co-ordinating agency more concerned with administration than planning. Source: Nelson, National Security and the General Staff; Darr Memorandum; G-1 History; G-2 History; Strength Accounting Special Planning Division History; Green, Thompson, and Roots, Planning Munitions for War; and Millett, Army Service Forces. ments overseas. The technical and administrative services had their own traditional personnel management systems. Lacking centralized responsibility for personnel policy and operations, the only practical alternative for the War Department when the manpower shortage did develop in late 1942 was to create another special agency-the War Department Manpower Board-for dealing with this aspect of the problem. Divided responsibility led to conflict among the various agencies of the Army over just how many men there were in the Army. Another special agency, the Strength Accounting and Reporting Office, was established within the Chief of Staff's Office to co-ordinate and standardize personnel statistics within the Army. Conserving military manpower was harder than conserving civilian manpower. The main problem that developed in this area was to provide an effective replacement system that would meet the needs of overseas commanders. The latters' advance estimates of how many people they would require were generally inaccurate, but the greatest difficulty was the inability of the Army to account accurately for troops "in the pipeline," moving from one organization, station, or area to another, in hospitals, on leave, on detached service, or at school. Divided responsibility for personnel administration inevitably led to conflicting reports on the number of men actually in the Army which the department could not reconcile. Public ventilation of these discrepancies caused Secretary Stimson and General Marshall acute embarrassment, especially in their relations with Congress. Research and development of new weapons and equipment in the Army suffered from subordination to production throughout the war. 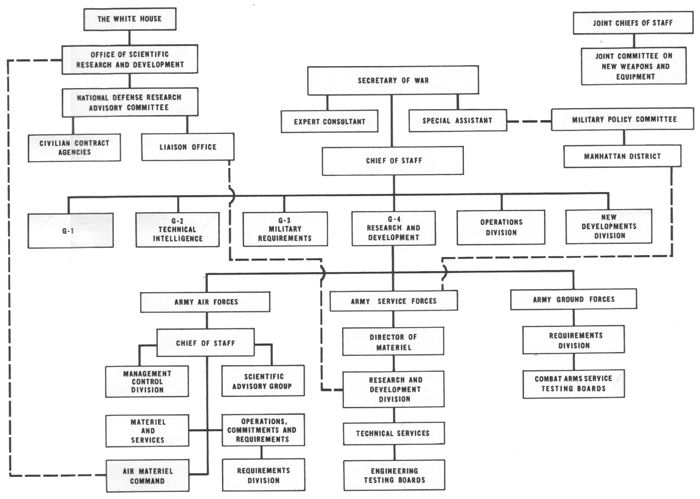 Agencies responsible for research and development, whether at the General Staff, ASF, or technical services, were subordinate elements within organizations primarily concerned with production and supply. Dr. Vannevar Bush, president of the Carnegie Institution of Washington, Director of the Office of Scientific Research and Development, chairman of the joint Committee on New Weapons and Equipment of the Joint Chiefs of Staff, and chairman of the Military Policy Committee of the Manhattan District, told the House Committee on Military Affairs that the armed services did not sufficiently realize the importance of science because military personnel by training and tradition did not appreciate the contribution it could make to national defense. They had not learned as industry had "that it is fatal to place any research organization under production departments. In the services it is still the procurement divisions who maintain the research organizations." Source: Nelson, National Security and the General Staff, New Developments Division History; McCaskey, The Role of the Army Ground Forces in the Development of Equipment; History of Research and Development Division, ASF; Green Thomson and Roots, Planning Munitions for War; Millett, Army Service Forces; Stewart, Organizing Scientific Research for War; Morison, Turmoil and Tradition; and Hewlett and Anderson, The New World. to produce a sufficient supply of standard weapons for field use. Procurement units are judged, therefore, by production standards. Functionally, the issue was again one of planning versus operations where mixing planning with operational responsibilities led to the neglect of planning. A second and more immediately important obstacle was the division of responsibility for the research, design, development, production, testing, procurement, and battlefield deployment of new weapons and equipment among many agencies. (Chart 10) The most serious division and the one which caused the most delay was that between the technical services as producers and the AGF and combat arms as users. Within the Army the technical services throughout the war were the agencies responsible for nearly all military research and development except for the AAF, which had its own programs. G-4 exercised General Staff supervision over the technical services activities through a Research and Development Section created in 1940. The combat arms were responsible for establishing military requirements and characteristics of new weapons and equipment, for service testing them under simulated combat conditions, and finally for accepting or rejecting them as standard Army equipment. Military requirements for new equipment in turn depended on the development of tactical doctrine. These two functions were under the General Staff supervision of G-8. the fact that the Materiel Directorate's primary interest in this area was in the requirements and specifications of those weapons and equipment already developed and proposed for adoption as standard equipment by the Army. Since technical services were the agencies mainly responsible for the conduct of the Army's research and development efforts, ASF's Research and Development Division was largely a co-ordinating staff between them and AGE There were lengthy delays caused by disagreement between the latter, representing the users, and ASF's research and development staff, representing the producers, over specifications which had to be negotiated. Another mission was to promote the use of common items of supplies, and there were lengthy delays in trying to get the technical services, particularly the Ordnance Department, to change their specifications. The Research and Development Division also assisted the technical services when they had trouble obtaining raw materials, equipment, and facilities for their research and development programs. Pressure on the department also came from the battlefields. Reports from the Pacific on the unsuitability of existing equipment for jungle or amphibious combat led General Marshall to send a team of experts to that area under Col. William A. Borden to investigate and report directly to him on the kinds of weapons and equipment needed in the area. Colonel Borden, an Ordnance expert with a flair for salesmanship and diplomacy, was then General Somervell's Special Assistant to the Director of Plans and Operations, a cover for his primary function as a troubleshooter. The Manhattan Project, organized to supervise the production of the atomic bomb, pioneered in what later became known as project management. The Army took over direction of the atomic program in mid-1942, when scientists working under the Office of Scientific Research and Development had demonstrated that an atomic weapon was technically feasible. Producing the fissionable material required to detonate the bomb involved enormous outlays of men, money, and resources, including huge amounts of electricity and water. The Corps of Engineers was selected to construct and operate the required installations and facilities because of its experience with large-scale public works projects. As Chief of Staff of the Army during World War II, General Marshall had two principal missions. He was the Army's chief strategy adviser and also general manager of the department. The increasing size and complexity of the Army's operations as the United States gradually mobilized for war made it physically impossible for Marshall to perform both functions. Since his major function was to advise President Roosevelt on strategy and military operations, he was forced to divorce himself more and more from his administrative functions as general manager of the department. From Marshall's viewpoint the existing structure and standard procedures of the Army's General Staff made it practically impossible for him to delegate responsibility for administration to the General Staff. Its committees were too slow in reaching collective decisions and could not distinguish between important questions and minor details which they constantly thrust at him for decision. Passage of the First War Powers Act in December 1941, right after Pearl Harbor, gave Marshall the opportunity to streamline the department's organization. Under the new organization he delegated his administrative responsibilities to a single Deputy Chief of Staff within the department and to three new major field commands, Army Ground Forces, Army Air Forces, and Army Service Forces. At the same time he selected his own principal deputies and subordinates. The reorganization left him free, as he insisted, to concentrate on military strategy and operations aided by the staff of the War Plans Division. Redesignated the Operations Division it became an operating headquarters instead of a planning agency. In effect it became a super general staff, bypassing the other General Staff divisions in the interests of prompt action. In this manner General Marshall could control departmental operations by decentralizing responsibility for their administration just as the pioneer industrial managers at DuPont, General Motors, and Sears had done in the previous decades. Although Marshall was apparently not familiar with these earlier industrial management reforms, it is not surprising that he, faced with similar problems, came up with similar solutions. Marshall's understanding of the basic principles of management as well as his exceptional judgment of men made him one of the department's most effective administrators. The results of his reorganization were so satisfactory that he strongly recommended applying the same principles in organizing a new department of the armed services after the war. General McNarney, as Deputy Chief of Staff and general manager, exercised tight control over the department, except for his increase in the functions and personnel of G-4 in mid1943. General Handy, his successor who had previously been Chief of the Operations Division, was more sympathetic to the General Staff, which Marshall and McNarney had largely ignored. Handy was also more critical of Somervell's ASF than McNarney. Supervising and co-ordinating the technical services along functional lines which cut across formal channels of command inevitably generated friction. If the offices of the chiefs of the services had been phased out of existence as had been done with the chiefs of the combat arms within AGF, there might have been less friction and ill-feeling. AAF headquarters deliberately created its own integrated supply system from the start and did not have to deal with any technical services with long-established traditions and influence. ASF might have solved its organizational and management problems by confining its top staff to broad policy planning and co-ordinating functions. The technical services chiefs argued for this alternative, but the experiences of the three major commands led their commanding generals to insist that their headquarters staff must operate in order to exercise effective control over their subordinate agencies and commands. There were conflicts and jurisdictional disputes between General Somervell's headquarters and OPD over logistical planning responsibilities and with AAF headquarters as a result of the latter's aggressive drive for autonomy. Although put together in haste, the Marshall reorganization worked as well as it did because General Marshall was the real center of military authority within the department. Both Roosevelt and Secretary Stimson supported him. In turn General Marshall delegated broad responsibility with commensurate authority to Generals McNarney, McNair, Arnold, and Somervell. While the Marshall reorganization lasted only as long as he was Chief of Staff, it was based upon the accepted military principle of unity of command and similar to concepts of administrative management developed by major industrial corporations.